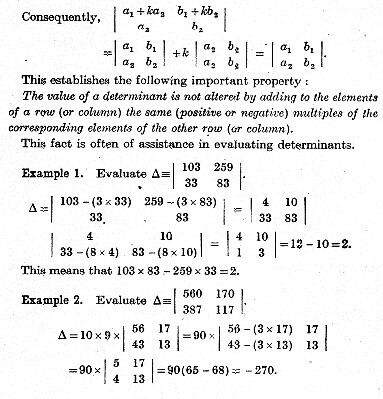 C V Durell’s Advanced Algebra, which was a standard sixth-form textbook until at least 1965, explains the “row operations” as the very first item in its chapter on determinants. It explains them first for 2×2 determinants, then later proves they also work for 3×3. They can be proved to work for n×n using the Levi-Civita symbol. 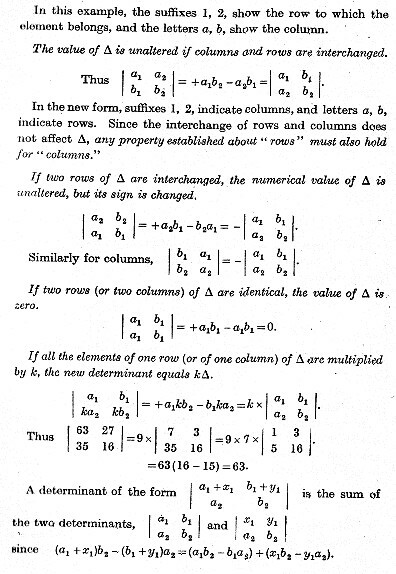 you either had to simplify the working-out with “row operations”, or do long multiplication. Or to see how the vector cross-product b×a = − a×b. Or to identify determinants as calculating to zero when checking whether a particular number is an eigenvalue for a matrix. Or, of course, to see how to calculate 4×4 and bigger determinants from “reduced row echelon form” (3×3 determinants are small enough to be calculated more conveniently by the “diagonals” method (as below). This entry was posted in FP3 further pure maths and tagged determinants on March 10, 2017 by dlandmj.